American president , a Republican, who was in office 2001-2009. He signed into law broad tax cuts. Having decreased government revenue, he offered no plan to pay for the cost of wars fought in both Iraq and Afghanistan. He increased the national debt, dramatically more than any president before him. 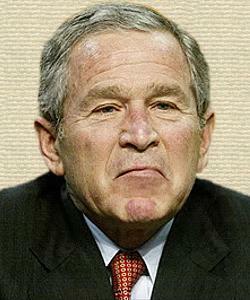 He had one of the lowest approval ratings during the 2008 financial crisis. He announced the U.S. would not implement the Kyoto Protocol on global warming. Embryonic stem cell research is at the leading edge of a series of moral hazards. Goodbye from the world's biggest polluter. Comment ending a private meeting with other world leaders to discuss carbon emissions at his final G8 summit in Japan. As reported in the media, for example, The Daily Telegraph (9 Jul 2008). Senior sources said Bush was making a private joke. According to the Telegraph, “He then punched the air while grinning widely, as the rest of those present including Gordon Brown and Nicolas Sarkozy looked on in shock.” It was about six months before his presidential term ended. Conclusion of speech, NASA Headquarters (14 Jan 2004). In Office of the Federal Register (U.S.) Staff (eds. ), Public Papers of the Presidents of the United States, George W. Bush (2007), 59. 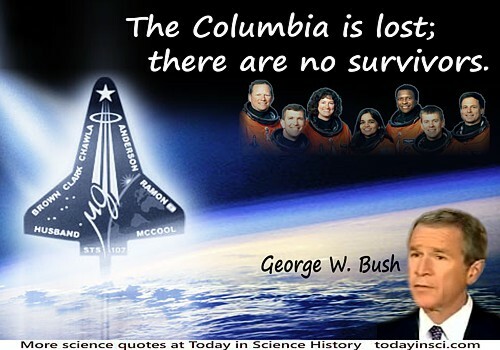 The crew of the shuttle Columbia did not return safely to Earth; yet we can pray that all are safely home. Address to the Nation on the Space Shuttle Columbia tragedy, from the Cabinet Room (1 Feb 2003). In William J. Federer, A Treasury of Presidential Quotations (2004), 438. We will undertake extended human missions to the moon as early as 2015, with the goal of living and working there for increasingly extended periods.